My mother has a manifestation box. It’s really just a shoe box covered in scraps of Christmas wrapping paper. It looks like an explosion of Christmases past. She’s used it for about ten years now with tremendous success. Her first time using it she just threw in a bunch of pictures of things she’d like in a house. She manifested a house that had everything she wanted, just not quite in the way she envisioned them. For example, she wanted a library with built-in bookcases, so she tossed a picture of a built-in bookcase in her manifestation box. She now has a single built-in bookcase next to her living room fireplace…not quite the same thing as a library. She quickly learned that when she puts things in her manifestation box she needs to be as clear as possible…just as you need to do with anything you want to manifest. My mother’s manifestation box works because it helps her release any resistance she has to manifesting her desires. She'll put really outrageous things in it that she wouldn't normally think possible, but because it eliminates her resistance, it works. A few years ago, she used her manifestation box to get a new job. And boy was she successful! She manifested the company she wanted, the location she wanted, the exact position, and even a massive increase in salary. The company even contacted her to see if she wanted to work for them. It only took her six weeks to manifest it. She decided to try it again this year for a new job. She got clear on what she wanted, made a list describing exactly what her new job would be like (e.g., huge salary increase, what it’d be like to work there, and so on). She placed her list in her manifestation box and forgot about it. She has the job she asked for, but it's not quite what she intended. Yes, her salary increased the amount she wanted and she only has to go into the office 3 days a week, but she forgot one key element. What’s the problem? She has the same job at the same company. Yes, the same job, the same title, the same company, just fewer days in the office and more money. Nothing else has changed. What did she want? A different job at a different company for less work and more money. You’re probably wondering why she’s complaining because what she got is great, but she really wanted to work somewhere else. You’ve experienced a time like that yourself…maybe you are now. 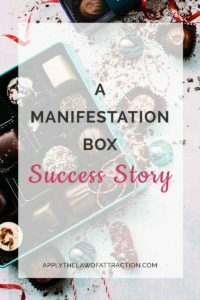 The manifestation box worked so well that my mother never asked her boss if she could go into the office fewer days a week. He brought it up to her – “Traffic’s been so bad lately, why don’t you work from home two days a week.” She never asked him for more money. It was simply given to her. And how long did it take? Three weeks. But she's back to the drawing board. Less work and more money aren't enough to make her stay. This time she made sure that when she placed her order to the Universe in the manifestation box, she didn’t leave anything out. She didn’t just assume the Universe knows what she wants. After only one week she has an interview at a different company for a different job, which incidentally, pays even more. So yes, this manifesting stuff does work. You simply have to get clear about what you want, ask for it, and allow it to happen. If you feel any resistance, try the manifestation box technique. It worked for my mother. Just get a box. Any box will do – an old shoe box, a cardboard shipping box, or a nice box purchased just for the occasion. Personalize the box. Really make it yours. My mother covered hers with scraps of old Christmas wrapping paper. Her idea was to turn it into a special gift that unwrapped itself all year long by granting her wishes. Put in your manifestation box what you want to manifest. If it’s a car, you can put in pictures of your car, a list of specs and features… or you can write down everything you want in your car, as described in How to Use the Law of Attraction for a Car. Once you put it in your manifestation box, you’re done. Forget about it. Just have faith and trust that your manifestation box will make your desires a reality. Wow <3 so how can this work for a 15 year old? I have a book that I use to put pictures of what I want in them so could I apply the same technique into my manifestation book? Hi Chris – Certainly! It can work for you regardless of your age. You can do the manifestation box technique with a manifestation book. There’s no need to limit it to a box. Hi I would like to give you my result using the manifestation box well it’s not my story but my 12 year old story she used the box to get an Ipad she put in a picture of it and wrote of it as if she had it and all the things that she was able to do on it. It took her 5weeks to get it but the only thing she wish she had done differently was be a little more specific she said “I want an Ipad” so she got an Ipad through her school for a year cause they started their first year of testing students use of Ipads in school. So while she has gotten an Ipad it is not her very own ,the box does work my 10 year old use it to get her new easy bake oven without asking me or telling me that she wanted one. I want to say thank you for this article it eliminates stress in trying to manifest things it’s so much easier this way even my kids are using it and getting results. Thank you. What a wonderful story! Thanks for sharing it, Trish! Hey! This is such a wonderful story!could you please tell me how to practice the law of attraction in steps!like ask,believe receive in more detail!thank u so much! Hi Poppy – If you read the articles on this site, you will receive more details on how to use the Law of Attraction. A wish box is an interesting approach. I had done something similar years ago. I created a box, colored it pink and then put in it all the words and a picture of a person I wanted to meet. I put the box away and didn’t think about it much. About six months or so later, I met a guy that looked so similar to the one I wanted to meet, it was scary! A bell definitely went off. Anyway, what do you with the stuff in the box once you get it? Toss it, bury it respectfully, etc? Hi Amela – You can simply toss it. If you want to bury it respectfully, you can do that too. Whatever works for you. Love seeing other success stories using the law of attraction. It really is life changing, it totally changed my life in just 4 years. Taking me from a single mom with nothing to living my dream. I log my full story on my blog with lots of proof. Keep spreading the word! Hey! I was just wondering 2 things. The first, can you put multiple things at the same time in the box? Like say an image of car we want, and an image of maybe a new computer? Thank you very much for the amazing story you shared with us! results are erratic. Some things are instant, others not so much. Thanks for sharing Deirdre! Come back and let me know your manifestation box success story. I have a question?.. how easy is it to manifest something big! Like let’s say winning the lottery!? Im not taking about about a fair amount, im talking about a ridiculous amount 🙂 is it possible to write the amount in my box and just hope that I win? Should I be specific about the time too? I don’t think im too good at manifesting much I need help at believing that im getting it? It’s really all I ever wanted. There is no such things as something big in the eyes of the Universe. Everything is the same “size”. It’s we, as people, who have the concept of some things being bigger than others. You can write the amount and put in your box, and have faith and trust that the money is yours. Be open to all the ways that the money can come to you. The lottery is just one method, but there are other ways you can achieve the amount you desire. The more opportunities you allow yourself, the faster it tends to come. Is it okay to date the picture or description and then when you obtain the item date it and keep a successful manifestation book? Wouldn’t that be an awesome way to keep tract of your success with manifestations!!! That’s a great story. I would like to share with you how I manifested my dream job. I got a job I very much disliked at a biopharmaceutical company 8 months after getting my masters degree. But because it took me that long to get a job, it was somewhat precious to me. However, after one year, I was even more miserable and burnt out that I ever was and decided that enough is enough. I took the leap of faith and quit without any other job lined up. I took the time and freedom to explore what I really wanted to do and discovered my passion in the human resources field. However, the HR industry in my country is quite immature and I could not find any positions that fitted into my aspirations, goals, capacity and capabilities. I applied to many HR position half-heartedly. I have a long standing desire to move abroad but was unsure on how to make it happen. After 11 months of unsuccessful attempts, I intensely decided that I will be getting a job offer for a dream position from abroad NOW. I created a Manifestation Book and wrote down daily entries of getting a great job and an amazing location. A couple of days later I came across a job advertisement for a HR position in Germany. The position was all that I could ask for in a job. I applied to it. For the next 30+ days, I spent most of my waking hours believing that the job is mine. I did everything it took to train my mind that I am getting the job. Besides the daily journal entry, I sent job offer emails to myself and also recorded myself affirming about getting the job and listened to it before going to sleep. About 10 days after the closing date of the application, I received and email from the company inviting me to the Assessment Centre in Germany!! The interview and assessments went smoothly and a week later they offered me the job! The salary is great, the company is huge and famous and most importantly it is the job I had dreamed of and a dream location. I am starting on December 1st 2014 in Germany and very much looking forward to it. The Universe has given me what I wished for. If you really want something and believe with unshakable faith that you will have it, the whole Universe will conspire to make it happen! Thankyou, for the post and all the other people that have written something, I will begin at once to put what I know to work into practice. It has worked for me duting 2008-20012 positively, then major setbacks, (also produced by law of attraction as I was thinking negatively) have delayed me, I am now healing and whole and this post has given me more fuel to get on it. Thankyou – ill keep you informed of what I manifest.